Are you working with front-end applications like Angular, React, Vue etc. Doing the production deployment is the most boring part. Because we need to do many manual steps to perform like npm install, ng test, build etc. This post will explain to how to automate all of these steps with CircleCI pipeline. Just push you changes to GitHub repository, and CircleCi take care everything. PDF documents are a very common form of hypermedia documents. Whether it’s books, bills, or invoices we consume PDF documents on a daily basis. In this article, we are going to learn how to generate PDF documents using Node.js and Worker queue called Kue. PDF generation is used in products such as E-commerce based applications, airline tickets, hotel booking, etc. We can use the same principle which I am going to show you below and apply it to implement the feature. Are you working with social applications and user profiles? This post is about implementing dynamic routes for Angular application with basic route validations. This article is a part of Angular routing series for better understanding, please check my previous articles. Here you find importing the dynamic route value and validating with a regular expression for protecting the application routes. Angular command line comes with excellent features which are helpful for generating new components, guards and services etc. I personally like the route guards, the way handling user authentication system. Let’s take a look the post that how to implement Angular lazy loading routing using route guards authentication to protect the application URLs. I am planning to split this article into multiple parts to explain it to better way. There are a number of advantages to implementing social login in your web applications. First of all, it best secures the user credentials, the user can use a single login for accessing multiple sites, this can automatically access the user details for further use, and many such. This article is about how to implement the social login with Facebook and Google using Angular and RESTful API. This social login helps to store social data of the logged in user into the database, so that it provides you valid user data like email, name, and others. Let’s see how this works, follow the live demo and code below. There are several payment options available in the market today. PayPal checkout option is one among them. 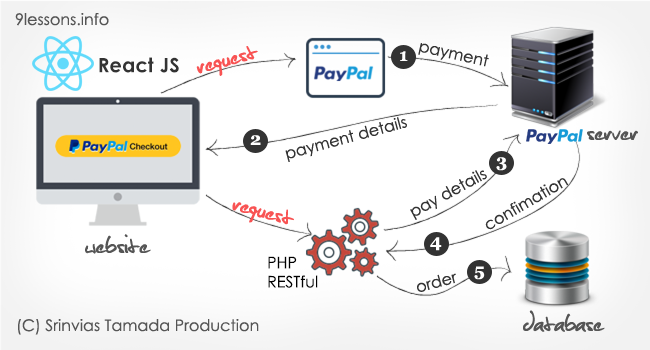 In my previous articles, I have already discussed few payment options - Braintree PayPal using PHP, Payment system and PayPal Express Checkout with PHP and MySQL. These are the most viewed and trending articles till this day. Today, let’s see how the PayPal Express Checkout works with React JS. Ewritingservice.com - top custom writing services. Thesisrush.com - best dissertation writing company. My Paper Done - get your college paper on any topic. Try professional service CustomWritings.com for custom writing needs.